On April 19th, 2017, community members and organizations that provide care and resources to seniors gathered to educate the public and policy members about the realities of an aging population. Dozens of seniors, community members, local officials, and organizations came to listen at our People’s Forum. Among the challenges of today’s seniors include the gaps in services and shrinking resources. 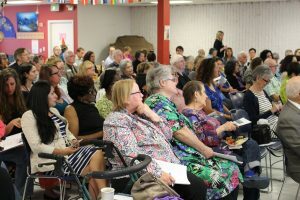 The event included two panel sessions of speakers summarizing the challenges facing seniors and adults with disabilities, as well as service shortfalls and shrinking resources. Antoine Favre, Sam McCrary, and Lucy Budahl share their stories about how care (or the lack thereof) has affected their lives, ability to care for loved ones, cook meals, keep their living areas clean, and maintain dignity and mobility. 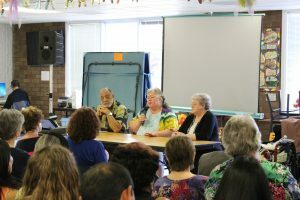 One panel speaker, Antoine Farve, a retired Army Veteran and sole caregiver of his wife of 51 years, urged officials in charge of creating budgets to see the importance of programs such as Oregon Project Independence, which allowed his wife Gladys to increase the time she spent at the Marie Smith Center for Adult Day Care. The time that Gladys spends at the Marie Smith Center allows Gladys to make friends and participate in activities that give her a reprieve from her life full of difficult events. It also allows Antoine to spend time taking care of himself, run errands, see friends, and just relax. The stories that were shared by members of our senior community brought to light many important issues that affect Portland’s senior population. Thank you to all of the speakers, organizations, elected officials, and community members who rallied today to speak about or listen to the issues that our aging population faces. Check out the Koin 6 news coverage of our event!